When I sat down to read and review the book "Calm Focus Joy: The Power of Breath Awareness", little did I know that author Heidi Thompson was also a fine artist. I knew that if her work was even remotely as intelligent and fascinating as her book - that she would be someone I would definitely like to interview for the Mind Body Spirit Artist Series. Well, as you will read, Heidi certainly did not disappoint. I hope you will find this amazing artist's journey and work as fascinating and inspiring as I did. Thank you Heidi! Heidi: I have loved painting, drawing, and making things ever since I was young. When I was five, I remember sitting in a mudpuddle scooping up the velvety warm muck and splattering it all over myself. There was something about the tactile, hands on, messy experience that has always given me great pleasure. Even now, at age 56, I have the same eurphoric feeling when I am pouring and splattering paint over my canvas. I grew up in Vernon British Columbia. My mom was an artist and was always drawing or painting. Our house was filled with beautiful paintings that she had brought over from Denmark. These paintings had a profound effect on me, though at the time I didn't realize it. I remember gazing at them a lot. When I was ten, we travelled to Europe and visited the Louvre and other museums. My mom was also interested in meditation and yoga, and took us to stay at ashrams. I grew up surrounded by books on Eastern philosophy, religion, and art. All of these things in my childhood influenced me, but I never believed that I could become an artist. My father strongly suggested that I find a more sensible trade. However, as soon as I moved away from my family and lived alone in Europe, I started to pursue my passion for art. I attended the University of Art and Design in Zurich for four years, and became a professional photographer. But even though I loved photography, I knew that I wanted to be a painter. Choosing to study painting was always a struggle. I was brought up to believe that artists couldn't survive - that it was a unrealistic dream. But my passion was too strong; I couldn't help myself. After graduating from the school in Zurich, I studied painting at art colleges in Nurnberg and Budapest. I was in Europe for almost nine years; seven of these were spent attending art schools and being an apprentice for a German artist. When I returned to Vernon in 1982, I set up a photography, publishing, and painting studio. I married Ted, a guitar maker, and we had one daughter. We are still together after 30 years. At some point, I went back to university to become a teacher. However, I have stopped doing photography and I rarely teach. All I want to do is paint. I live in Vernon and paint full time. Now and again, I create books. 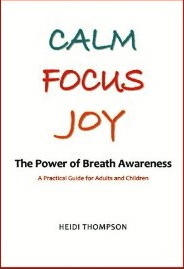 Recently, I have written and published Calm Focus Joy, a book about breath awareness and helping children focus better. MBS: That sounds wonderful, to be able to study art in Switzerland. What is the one big thing that you took away from that experience? Heidi: There was one significant experience which continues to affect my paintings today. I was attending first year art studies. We were given a technical assignment to shade a 3" x 4" rectangle using a sharp 3B pencil. The shaded area was to be perfectly even with no lighter or darker areas. It took several days to finish. Whenever I thought I was done, my professor saw some discrepancies which I had to correct. It seemed an impossible task and at times I questioned this "Swiss" perfectionism. 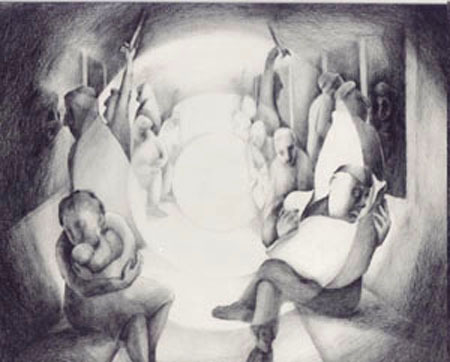 However, while focusing on the work and the shading, I experienced profound, almost visionary insights. At night, I began writing about the meaning of grey and how it symbolizes life. By focusing exclusively on one small patch of grey, new dimensions of its reality revealed itself to me. Today, many of my paintings resemble monochromatic rectangles with evenly distributed fields of color. I am still applying the same meditative and focusing principals that I learned in my first year of art school. MBS: You also mentioned that during your time in Europe you were an apprentice for a German artist. What type of artist - and what was it like working as an apprentice? An apprentice is usually quite different then working as a studio assistant, which many artists have spent time doing as well. Heidi: After earning my Swiss photography degree in 1979, I still wanted to be a painter. I met Nurnberg artist, Oskar Kollar, who was well-known for his minimalistic abstractions of landscapes and flowers. He was prolific and sold his work all over the world. He invited me to live with his family, and in repayment for food and rent, I would work half days in his studio doing jobs like stretching canvas, cutting matts, framing, operating the printing press, cleaning, and shipping paintings. I would also help to hang exhibitions, both in galleries and in his home. In the mornings I worked alongside Oskar and then, for the rest of the day, I went to cafes and bars to draw and paint people. He offered weekly critique, and this helped enormously with my drawing. His focus was always on a work's composition. He believed that every artist evolves a personal composition - his or her unique way of seeing the world. You could distinguish a Picasso from a Monet through their painting's composition. He explained that composition is all about how space, line, and color interrelate; it is through this relationship that the artist expresses feelings, ideas, and personal truths. While I was doing my "apprenticeship", Oskar also helped me to prepare my art portfolio. In 1980, I was accepted into the Nurnberg Art Academy, which I attended for one year before going to the University of Art in Budapest. The most important lesson that I learned from Oskar was that if you wanted to be a painter, you had to paint. This was his motto. This meant making a decision to be a painter and then struggling through years of not being recognized or paid. Oskar showed me that it was possible to be an artist. He was in his mid-fifties and was financially successful, raised two children, and had a beautiful home. He also warned me that not all artists can sell their work - some do and some do not. However, this shouldn't make a difference to one's commitment to the path. MBS: After reading your last answer, I can't help but think about what a totally different attitude that is - that a person should expect to paint for years and struggle to make it as an artist - if they do at all. Sure a person needs to support themselves, but it seems like in the American culture, and probably Canadian, there is such an attitude of entitlement and immediate success. For many people they don't even bother making art unless they can 'sell' it, and then it's substandard and mass media driven. And then, like you also mentioned, you have to put in the work, hard consistent work. Any thoughts? Heidi: Artists may feel entitled when they hear about other artists selling work for big bucks. But the reality is that there are more artists today than ever before in history. Overabundance makes art redundant. Everyone has a camera; everyone is an artist. As well, art became a profitable investment, escalating prices to incredulous heights. So the poor artist, like dreaming of becoming a rock star, wants to become the next Damian Hirst. And why not? It is obvious that you don’t need your masters in art or talent to make art. Because anything goes when it comes to art, people may see art-making as a way to strike it rich. Well, for me, these dreams may have crossed my mind in my younger years, but experience has shown me that you need to create what makes you happy, find a balance in life so you can stay healthy, and be grateful for those occasional sales that give you the validation every artist needs. I actually enjoy that there are no guarantees. Art remains a mystery. Success (and whatever success means to an individual) depends on accidents, luck, connections, economy, and other uncontrollable and unforeseeable factors. Because there are no guarantees, the struggle to survive as an artist continues even today. I think that the hardest struggle is staying committed to one’s unique vision. Artists often have an extraordinary way of seeing things. Sharing these insights with others becomes an important “duty” or calling. Again, even when artists pursue their vision, there is no guarantee that he or she will be understood or appreciated. Nevertheless, there is something noble and worthy in the struggle to stay true to one's vision, despite financial hardships. Many of our most influential artists sacrificed comfort and security to bring into the world art that changed how we see, feel, and understand. Their artistic struggle may or may not have “paid off”, but most of us are grateful for their contributions. MBS: Several months ago when I was going over the background information for your book Calm Focus Joy, I remember reading about the long practice history you have with Buddhist Meditation. Spirituality is obviously a very important aspect of your life and is reflected through the artwork you create and the writing that you do. 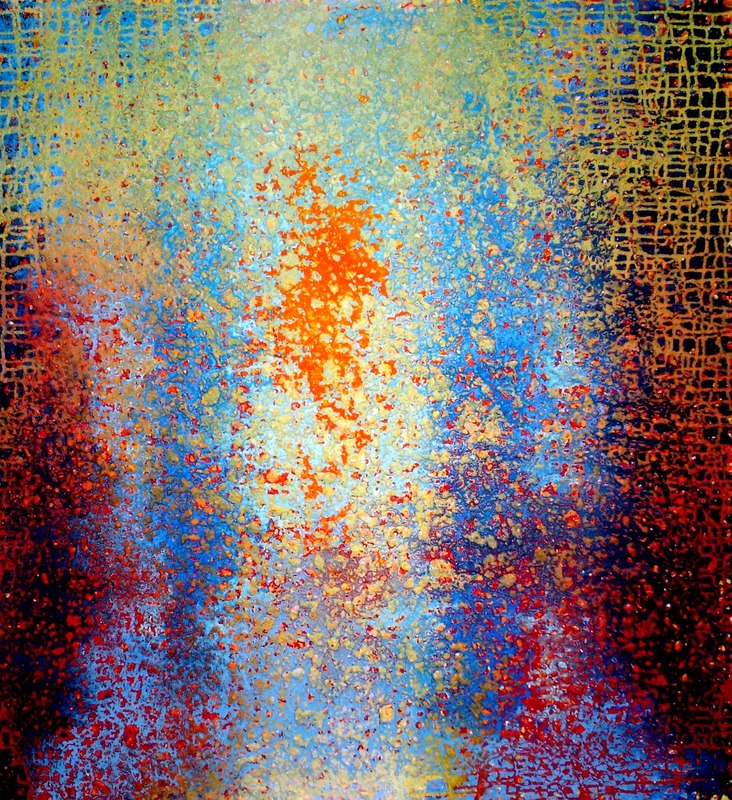 What insights do you have about spirituality and your artwork? Heidi: I have been practicing Vipassana since 1982, which is a meditation technique rediscovered and taught by Buddha. Buddhists practice forms of Vipassana, but I am not a Buddhist. Vipassana is a universal, non-religious technique used by people with different beliefs and religious backgrounds. Vipassana, as it is currently taught at 10-day silent retreats under the instruction of S.N. Goenka, requires students to do breath awareness or Anapana (observing sensations of the breath) for three days, and then Vipassana (observing sensations in the body) for the final seven days. Over the past 30 years, my Vipassana experience has not only positively influenced my health and relationships, it has influenced how and what I paint. My early artwork was shaped by old European tradition and expressed what I percieved the human condition to be. My drawings, paintings, and photographs were of people. They were dark, depressing, and expressed universal suffering. This is how I saw and experienced the world in my twenties. It is possible, though, that these disturbing images may have been expressing my confused state-of-mind and psychological struggle that came from living alone, dealing with my past, and trying to find myself. 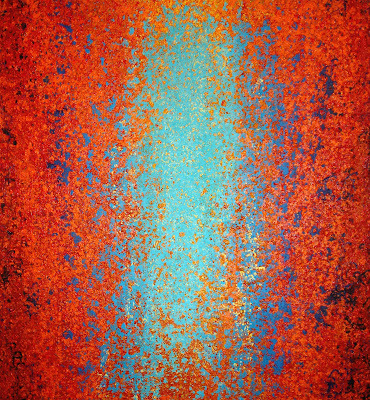 My current work, in contrast, expresses my inner physiological condition and a more uplifted state-of-mind. Meditation training has enabled me to turn my attention away from my intellectual, agonizing thoughts, and calmly focus on bodily sensations. Focusing on sensation actually changes my state of mind and lets me experience an amazing, peaceful, and energizing dimension of myself. Meditating has helped me to experience who and what I really am - a vibrational field of perpetually moving sub-atomical particles. The more I experience this reality, the more my paintings mirror what I am discovering. My paintings, at least to me, express my perpetual, vibrational, changing, sensational truth of who I am. MBS: What is a typical work day like for you? Do you work on your artwork everyday? Heidi: I love daily routines, but interruptions and unexpected challenges seem to outweigh any schedule. On a fruitful day, I wake at five and meditate for about an hour. At six, my husband, Ted and I have breakfast, planning to get lots done. But we end up in lengthy discussions about family, problems in our work, health, future plans, dreams, and figuring out what the purpose of life is. This takes at least two hours. We are both in our mid-fifties, and "purpose" seems to be a major topic. I always plan to paint, so if all goes well, I go to my studio, which is in a separate building overlooking a beautiful wild field with deer, bears, owls, and coyotes. Recently, I almost bumped into a growling bear. Once I start painting, I spend most of the day working. While waiting for my paintings to dry or if I finish one, Ted and I go on a walk, hike, swim, or bike ride. We live out in the country, so we are surrounded by nature. On many days, I get distracted from painting. I end up either working on my book, which involves interviews, responding to emails, or going to Toastmasters to improve my speaking skills. I also give the occasional workshop. In the evening, we eat a great vegetarian dinner (I like cooking), and we sit around and continue discussing. Even if I had no interruptions, I couldn't paint everyday. I am motivated by inspiration, which only comes in waves. It is difficult to find the energy to paint if I do not have a goal. So I am constantly creating goals for myself. MBS: Are there any particular materials or format you prefer to work with? 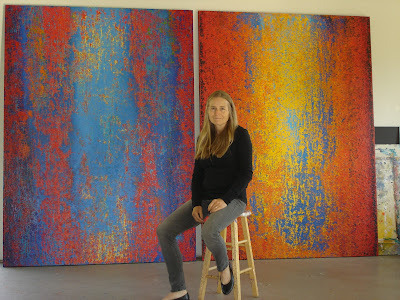 Heidi: I enjoy working on larger paintings up to 66 x 90 inches. After stretching the canvas, I prime it with gesso. Then I create a textured surface using a thick mixture of silica sand and gesso. I splatter this mixture evenly over the whole canvas. Once this rough surface dries, I prime it again. I begin my painting with flowing colors; maybe dark Prussian to light turquoises. I use acrylic paint because it doesn't smell bad, it dries quickly, and it lets me spontaneously repaint a canvas several times - sometimes seven to eight layers. Depending on my mood, I use one of two techniques. My first, more random and accidental approach, involves applying layers of color. I will let the paint dribble, flow, and do its thing. I ususally tip, tilt, or turn my canvas around to change the direction of paint. This often creates patterns or stripes, which show through later. I dry sections of these colors and patterns. Then, with a garden hose, I wash away sections that aren't quite dry. I may scrub the drier paint surface if I want more underlayers to show through. I call this method the "patina" approach. I am inspired by weathered surfaces and simulate the weathering process using sun, wind, and water, and friction. For me, the remaining scrubbed, washed away surfaces expresses change, process, transition, and the impermanence of matter. 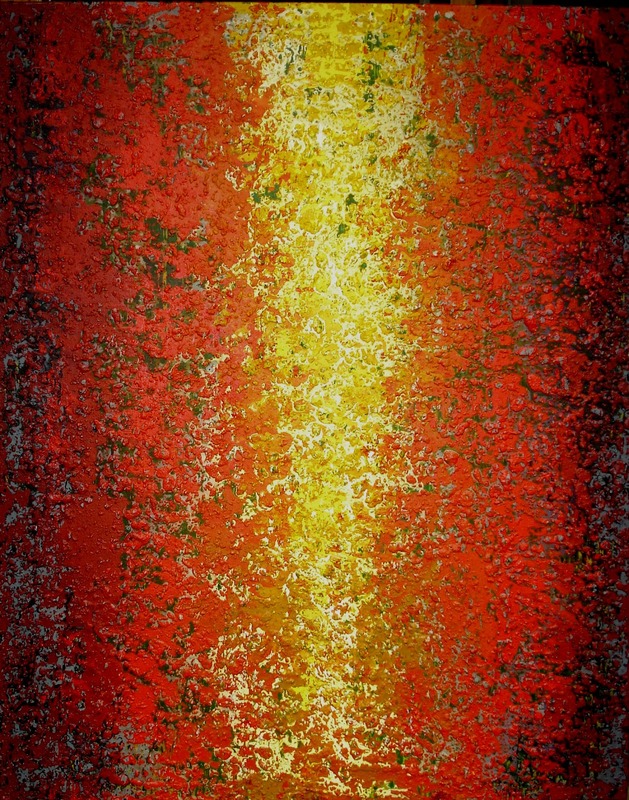 The other technique is called "splattering". Although this sounds random, it is more controlled than the previous approach. It is a highly controlled spattering, which allows me to build up surfaces without any accidents. I use a 1 inch fan brush and a stick. I load the brush with paint and then tap it lightly on the stick. The paint flicks onto the canvas creating beautiful delicate splattery lines. I was inspired by Jackson Pollock, but I prefer not pouring the paint or using heavy, large lines. I prefer the delicate look. I build up layers of color allowing space between the lines. I often create a dark, almost black edge. This edge somehow encloses the the random chaos and reminds me of my own body. Inside my body is subtle, delicate movement, sensations, and transformation. But my physical body seems to confine this randomness. I feel the same about the dark boarders enclosing the color energy field. 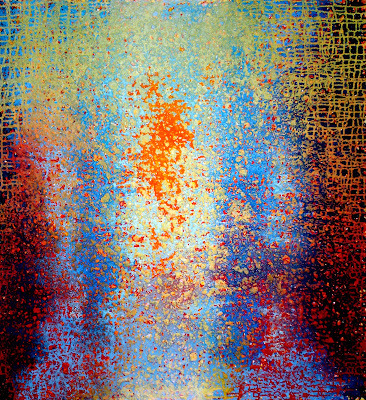 If you stand close to the painting, you would see that the weave comprises subtle complementary colors. 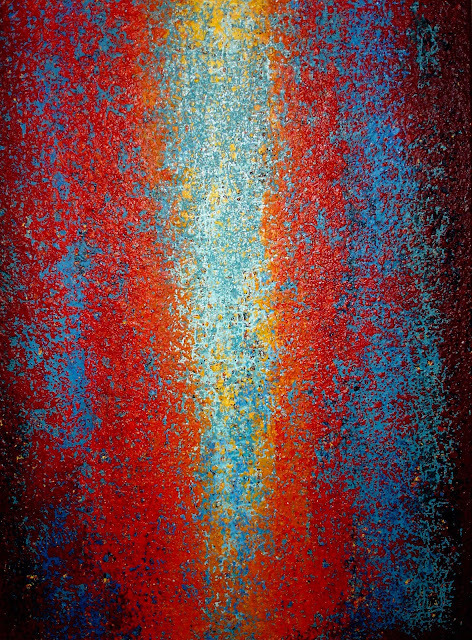 For me, monochromatic paintings need to incorporate all three primary colors, yellow, blue and red, to emit a natural, healthy energy. This may have something to do with the fact that we need white light to be healthy. White light is made up of primary colors. 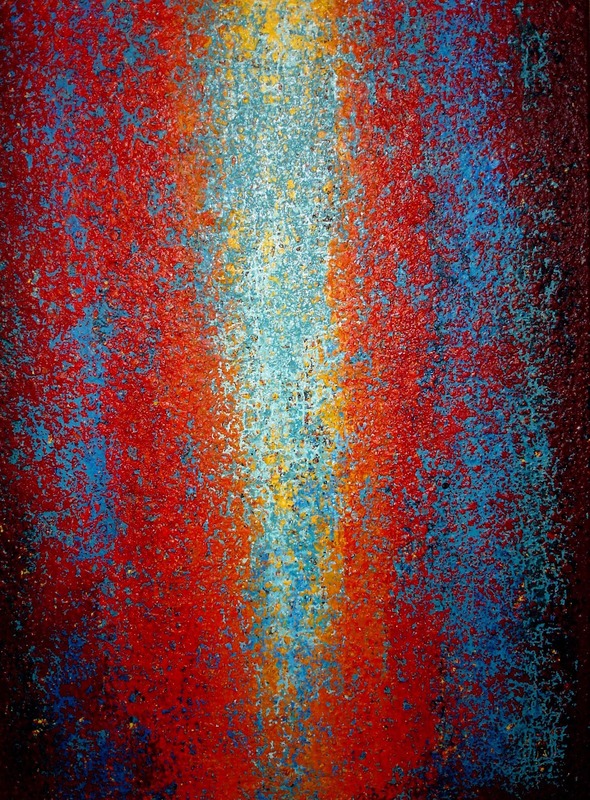 When I am successful, these meditative, one color paintings express my experience of inner vibration, dissolving separation, unity, and peacefulness. MBS: You are also a writer. How do you see your writing as an extension of your creative process? Also, how do you effectively manage your time to do both? Heidi: I have met many artists who also express themselves with words. Although we artists are predominately visual people, we are also philosophers and thinkers. When we feel that there is something important to be said that can't be done with painting or artwork, we artists may try writing. Some are really good at it. I am not skilled and have struggled to become more clear and concise. I felt compelled to write my book, Calm Focus Joy: The Power of Breath Awareness, because I wanted to share this amazingly helpful technique with others, especially children. I see a great need in the world to help educate children. They need to learn ways to gain more confidence, self-knowledge, and calmness. Schools aren't teaching these skills. Over the years, I have conducted breath awareness workshops with children and have seen positive results. To see children learn how to focus, calm down, and tap into their inner worlds was very rewarding. It seemed to be more purposeful than painting. So, at times I was dedicated only to helping children. However, when ever I let too much time pass without painting. It has been a juggling act with between spending time writing or painting. Luckily life is long, our children are independent, and I do have time to both write and paint. Heidi: There are countless ways to pursue one's artistic passion. Many successful artists would suggest unique and non-conventional routes to achieving your artistic goal. I had the opportunity to ask one of America's iconic painters, Robert Ryman, the same question when I was a student in Zurich. He told me that he never went to art school and learned everything about art while working as a watch guard at a public art museum. He spent his days studying the paintings of masters and thinking that he could do that too. Ultimately, a person's passion, talent, drive, and ambition will determine whether or not they will succeed at becoming an artist. My path was more traditional. I would recommend a traditional path for serious young artists who are wanting advice. I went to art European art academies and earned a degree. I also spent a lot of time in historical and contemporary art museums. I worked hard and drew almost every day, When I wasn't drawing, I was reading about art, especially writings written by artists. I was serious about my passion and tried to get the best education I could. My advice for any one who is just starting out would be to attend an art foundation course in a reputable school. Most art colleges offer such programs. Foundation studies teach a variety of skills giving students the important opportunity to explore different areas of art-making. Usually, the focus of these programs is to develop drawing and observation skills, which I still believe, are essential for artists. Drawing the human figure and face may be one of the best ways to learn. Foundation courses also offer things like color theory, silk-screening, jewelry, pottery, photography, film, painting, sculpture, 3-design, graphics, web design, and art history. As well, there are usually classes that develop critical thinking, writing, and a deeper understanding of art and humanity. The best thing about going to art school is the experience allows you to become immersed in art. With the support of teachers and peers, you can dive into the wonderful world of creative life without thinking too much about the practicality of life. For this reason alone, I would recommend going to art school for several years. Many students, after one year of foundation studies, quit and pursue a more adventurous path. These paths are perfectly valid. They include traveling, learning new languages, having a family, painting, or even working at mundane jobs. Art is about expressing life, and all things we do in life become material for our art. I knew of a young artist from Toronto who was bored with art school, quit after a year, and started painting hundreds of pieces to sell on Ebay for $25.00. As he sold them, he gradually increased their prices. He made a lot of money, and could afford doing his more "serious" work. A gallery was intrigued with his unique approach to painting and picked him up. Through this high-end gallery, he sold his serious paintings for around $100,000. An art student of mine went on to get her BFA degree. She then combined her dance and gymnastic skills with painting. Now at age 25, she is raising hundreds of thousands of dollars for charity doing her high acrobatic art painting stunts. As you can see, success comes to those who are creative. The safe and traditional confines of a regulated art academy can never guarantee an artist's success. However, a serious education and even getting an art degree has benefits. Provided a young student stays true to his or her vision while at school, there are advantages to earning an art degree. Not only do these degrees help you get recognized as an expert in your field, they show future employers, galleries, and art collectors that you have invested time and money into yourself as an artist. If you have taken yourself seriously and learned your craft well, they will be more confident to invest their money and time in you. As well, teaching art, whether privately or at a school, is a viable means to earn a living. Throughout history, many famous artists taught art to support their art careers. Therefore, having a degree, will help you be seen as a more qualified teacher. To teach at college level, you will be required to have at least a BFA, though most colleges now require a Masters. Artists do not always do art, but can be employed in many areas of our society. Having a few years of education under the belt, and even a degree or two, makes life easier. Take your art education seriously and attend at least a one-year foundation course. Learn how to draw and observe. Study some art history. Choose a preferred field of art and learn everything you can. Become the expert. If possible, earn a degree. Go to galleries and museums, learn from the masters, and read artists' writings. Copy other people's work to learn, but never loose your unique vision. Find a mentor who will give you feedback and support. Work hard, discover your vision, and be creative when it comes to practical survival. Never lose your integrity for the sake of art.